Characteristics The human cell line blot is designed for proteomics research in screening for antibody and protein expression. It carries 8 different human cell lines with 15 μg of total cellular protein in each lane. Proteins were separated in 4-20 % SDS-PAGE gel and transferred onto nitrocellulose membrane. The cell lines included in the blot are MCF7 (breast, adenocarcinoma), HeLa (cervix, adenocarcinoma), HT-29 (colon, adenocarcinoma), 293 (kidney, transformed with adenovirus 5 DNA), Hep G2 (liver, hepatocellular carcinoma), A-549 (lung, carcinoma), SK-N-SH (brain, neuroblastoma), and PC-3 (prostate,adenocarcinoma). Samples loaded: Lanes: 1: protein markers, 2: MCF7, 3: HeLa, 4: HT-29, 5: 293, 6: Hep G2, 7: A-549, 8: SK-N-SH, and 9: PC-3. 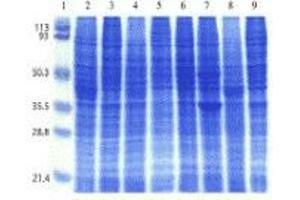 Application Notes For Western Blot, the blot can be blocked with 1 % BSA or 5 % nonfat dry milk for 1 hour. Incubation takes 30 minutes to two hours with primary antibody, and 30 minutes to one hour with secondary antibody at room temperature. Handling Advice The blot can be reused after stripping. Storage Comment Store at 4 °C.